HÅG Capisco Puls Office chair. The Capisco Puls design is based on the legendary saddle: the way that you are forced to sit when riding a horse - with good posture, legs extended and in constant movement - is considered the best for the body, especially for a full working day. The seat has an integrated cushion for improved comfort. Seat height and depth, headrest and back height can be adjusted. Tilt resistance is also adjustable and lockable. The foot grips located on top of each castor is a direct reaction to our tendency to rest our feet on the base of the chair as we move about. 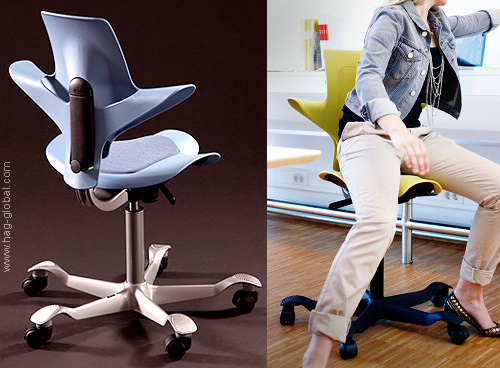 The most popular reason for choosing ergonomic kneeling chairs for office is health. Because so much of the public is now aware that a sedentary, inefficient office environment is the catalyst for pain, scientists and reputable office furniture manufacturers have been searching for ways to fix it. Thankfully, healthy kneeling office chairs are proven to do just that. Kneeling chairs work by tricking the upper body into thinking that the user is standing, which forces proper posture. By bending the knees downward and the pelvis forward, such as when standing, the spine is encouraged to adopt proper alignment. For many, improper alignment is the cause of office-related back pain, so these specialized chairs are adept at pain relief.